LATE-NIGHT, HATEFUL-8, SLOPPY MINI-DAGWOOD GOES GREEN! Before another minute can tick by, I grab one slice of Nature's Harvest 40-Calorie Multi-grain bread, smear with Jalapeno mustard, cut in half, stack on 50/50 greens, Swiss cheese, cucumber & tomato slices (spiced with ground black pepper, garlic powder, Lite 50/50 salt, and ground cayenne pepper), then add 98% Fat-free Oven Roasted Chicken Breast slices, white onions, close the sandwich and top with two speared green olives. On the side: white tortilla chips, one pepperoncini, and a cup of Carey Salsa Mexicana Verde (sprinkled with shredded sharp Cheddar cheese & ground cayenne pepper). 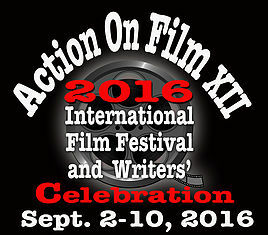 Run to the comfy chair, roll the movie, and eat! Delicious! The grand and wise Facebook "Memories" algorithm dredged up a fine one today. Indeed, here's an oldie but a goodie! 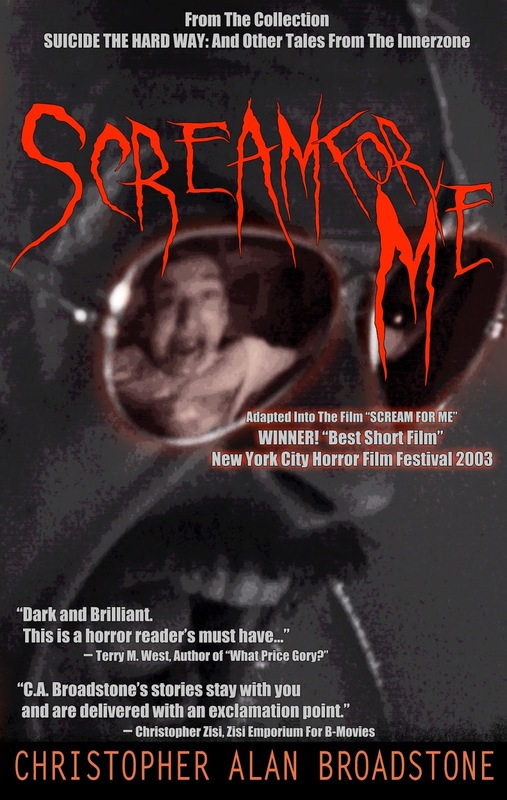 SCREAM FOR ME, written as a short story a million years ago, then several thousand years later adapted into a screenplay, and then eventually made into a 16mm short film (also directed and edited by good ol' me). 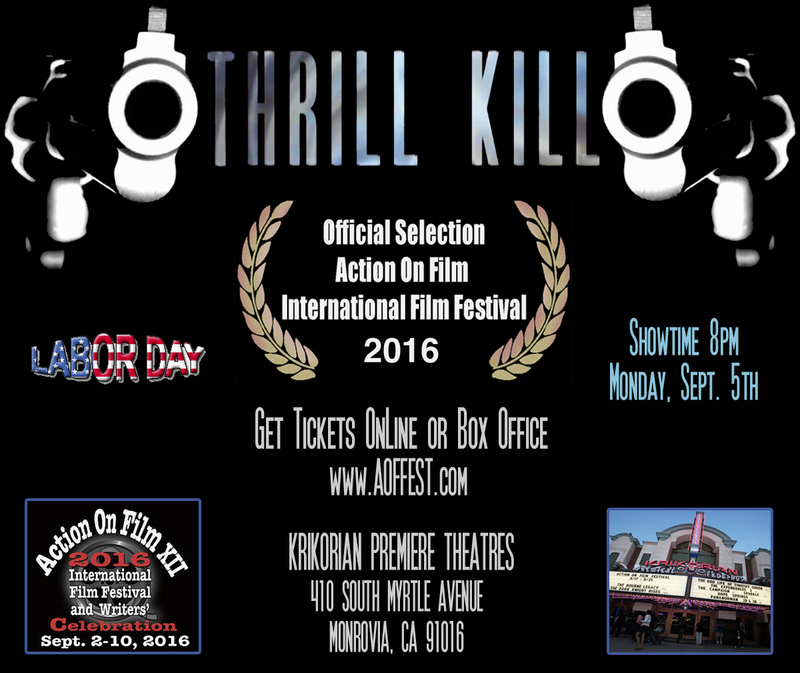 A few years after that it won BEST SHORT at THE NEW YORK CITY HORROR FILM FESTIVAL. It also went on to play many international festivals, receive great critical acclaim, cause some viewers to walk out of the theater (lol! ), and was released on a few compilation horror DVDs. Finally, it was released with my other two shorts, MY SKIN! and HUMAN NO MORE on the anthology 3 DEAD GIRLS! 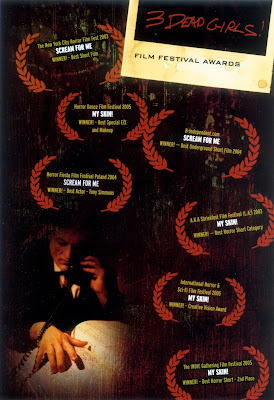 with many hours of extra featurette docs, photo galleries, and outstanding (and often hilarious) commentaries by myself and actor TONY SIMMONS, as well as special commentaries by EVE BLAACK (plublisher HACKER'S SOURCE horror mag) and CHRISTOPHER WEBSTER (Exec. Prod. for HELLRAISER, HELLBOUND: HELLRAISER II, SEVERED TIES, and others). SCREAM FOR ME is the original short story adapted into the film SCREAM FOR ME: directed by Christopher Alan Broadstone and starring Gabriel Sigal, Lora Cunningham, and Tony Simmons. SCREAM FOR ME won BEST SHORT FILM at the NEW YORK CITY HORROR FILM FESTIVAL 2003. It is currently part of the anthology DVD 3 DEAD GIRLS! (Available on Amazon). 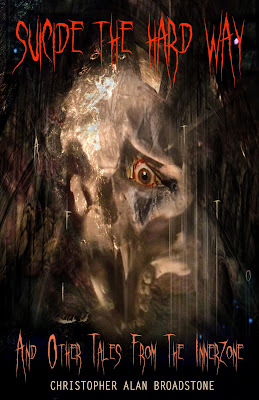 This shorty story edition of SCREAM FOR ME also includes a Teaser Excerpt from the short story SUICIDE THE HARD WAY, from the story/screenplay/poetry collection SUICIDE THE HARD WAY: And Other Tales From The Innerzone. 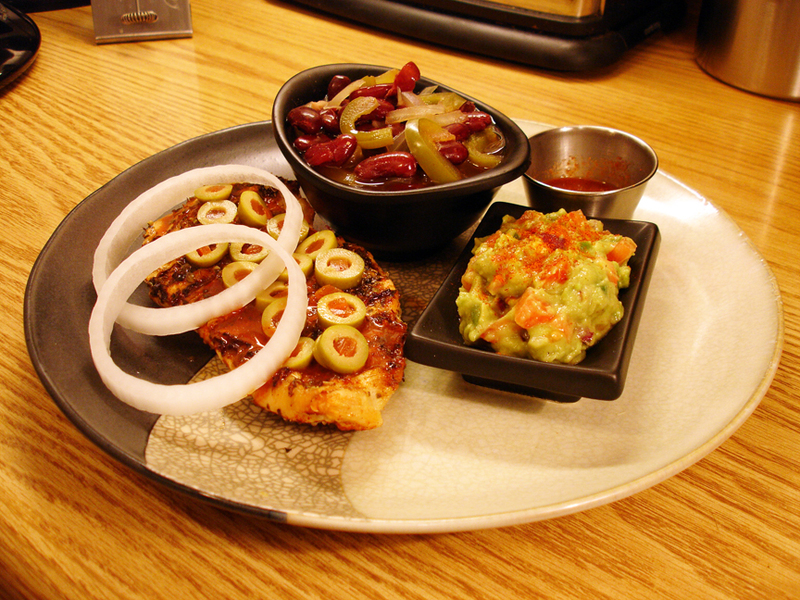 GRILLED CHICKEN BREAST, CHILI BEANS & FRESH GUACAMOLE! This one was a little work, but well worth it! First the guacamole––in a mixing bowl scoop out the contents of one large avocado and mash up completely in the bowl, next add one tablespoon of lemon juice, diced red onions, diced tomatoes, one diced Jalapeno pepper, and spice with garlic powder, ground black pepper, ground Cayenne pepper, and Lite 50/50 salt (all spices to taste). Place in the fridge to chill. Now the chili beans––pour one 15oz can of organic red kidney beans into a microwave safe dish, add sliced white onions and green bell peppers, then spice with chili powder, garlic powder, and Lite 50/50 salt (all spices to taste). Add spring water until all contents are covered. Heat in the microwave for 5-6 minutes or until piping hot. On the grill (my NuWave Oven) place one boneless chicken breast cutlet, then spice with garlic powder, ground cayenne pepper, and oregano. Grill for 7-8 minutes, flip over, spice the new topside as before, and grill another 7-8 minutes (or until 170 degrees reads on the food thermometer). Place the chicken on a dinner plate, pour on Tapatio Hot Sauce (to taste) and top with sliced green olives and two raw, white onion rings. Ladle the chili beans into a small bowl or cup and spoon out a healthy helping of the freshly chilled guacamole (drizzle with ground Cayenne pepper). Add a condiment cup of Tapatio Hot Sauce for that extra kick. Just fantastic! VEGGIE AVOCADO BLACK-BEAN CHEDDAR BURGER! Strain one 15oz can of organic black beans and pour into a large mixing bowl. With a spoon mash the beans into a paste, then add one fresh ripe avocado––mash the avocado well––add one egg, and mix thoroughly with the beans. Spice with the juice of one lemon, Tapatio Hot Sauce, Frank's Red Hot Original Cayenne Pepper Sauce, garlic powder, onion powder, paprika, and Lite 50/50 salt. Dice several white mushrooms & one large Jalapeno pepper and process in a blender until nearly a paste. Add the mushrooms and peppers to the other ingredients. Mix all together thoroughly, adding breadcrumbs (or in my case, finely ground tortilla chips) until the paste has a very thick consistency. Next, spray a small sheet of tin foil with Canola oil and form a patty on the foil with the veggie burger ingredients. Grill for 8 minutes, then slide burger off onto grill––and flip––and cook for an additional 8-10 minutes. Add thick slices of extra sharp Cheddar cheese and heat until melted. 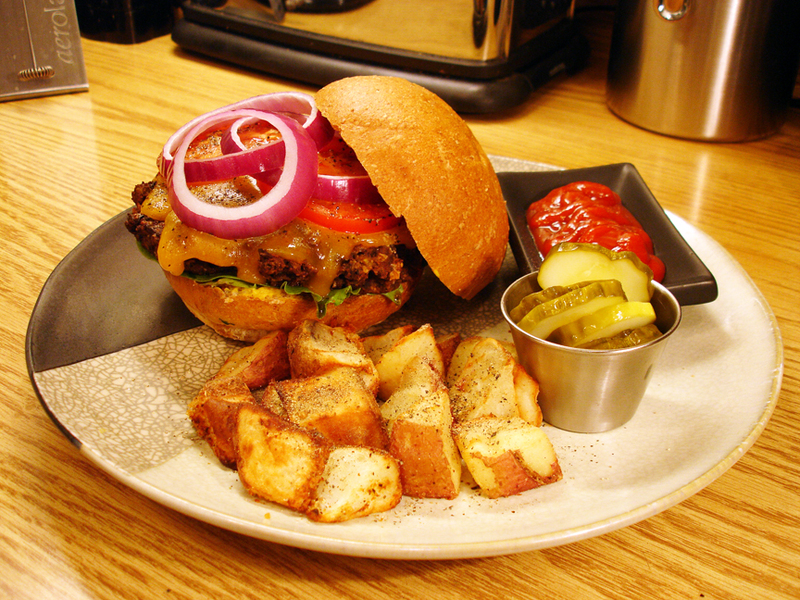 On a lightly grilled Kaiser Roll spread Jalapeno mustard (or other), add a layer of 50/50 spring greens, then the burger. Top with fresh tomato slices, Worcestershire sauce, and red onions. On the side: Claussen dill pickle slices, grilled redskin potato wedges & ketchup. Very healthy, spicy, and absolutely delicious! 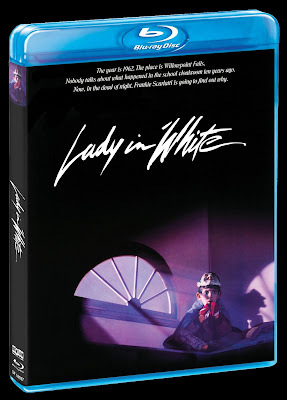 Frank LaLoggia's ghostly coming-of-age classic "Lady In White" is finally available on Blu-ray and will certainly look lovely in high definition. The warm color-correction and Autumn, Halloween, and wintry set pieces should defrost the eyes and soul of the kid in all of us. Watching the film is like snuggling up in a toasty chair by the fire and reminiscing about a beautiful, yet terrifying, nightmare you had when you were younger. One that kept coming back again and again, night after night, and in adulthood has never quite been lost to time. Not unlike the "Lady In White" in the film itself. 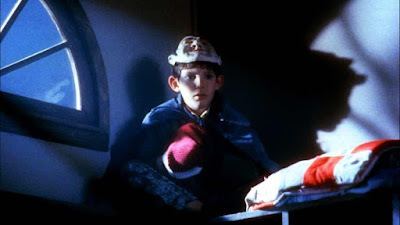 The movie was made in a pre-CGI world, and the practical and optical effects are now surreal and wonderful to watch––floating bodies, hovering ghosts, and apparitional, unsolved child murders. And this is where "Lady In White" brings the young Frankie Scarlatti (played by an adolescent Lucas Haas) into adulthood. These killings also bring the viewer into adulthood, making all of us voyeurs as guilty as any of the Willowpoint Falls townsfolk. The focus of this particular tale is on one murdered girl and the ever haunting "Lady In White" that have overshadowed Willowpoint Falls for a decade. 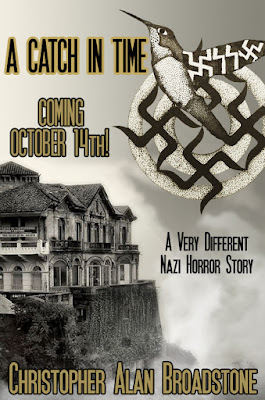 Frankie inadvertently discovers the ghosts, is haunted by them, and is compelled to follow them––even begged to follow them––on their nightly journeys in efforts to reveal the secret, and motivations behind their untimely deaths. They want the real killer exposed at last. And Frankie does too; yet not only to bring the truth into the light, but because he has changed inside, which is stated poignantly in the film, when he says to himself one Christmas morning: "As for me, I'd grown up just a little bit more than I was supposed to, I think. Responsibility had become my constant companion. And I was no longer afraid of what I could not see." Soon enough his newfound maturity will bring him face-to-face with a much greater horror than any ghosts he's previously encountered––a horror all too close to home. For myself, "Lady In White" makes me think of some earlier films, like "The Goonies"––for it's autumnal, northern coastal American vibe––and films that invoke elements of paranormal fantasy, like Disney's "Escape To Witch Mountain". Although "Lady In White" is not an adventure film, it is nonetheless adventurous for young Frankie Scarlatti. To current generation viewers, "Lady In White" will remind them of a much newer horror film, "Mama", produced by Guillermo del Toro. "Mama" is more of an edgy terror with jump scares, but it clearly borrows from the the film "Lady In White" in story and theme––"A mother's love is forever. "––as well as the fantastical ending of the ghostly, miserably lost "Mama" craving for the return of her child. The film score for "Lady In White" is also composed by director Frank LaLoggia and is quite lovely. Pay attention to the music when viewing the film and seek it out on CD. Overall, "Lady In White" is a wonderful diversion for a cold, stormy night and an armchair trip down memory lane. 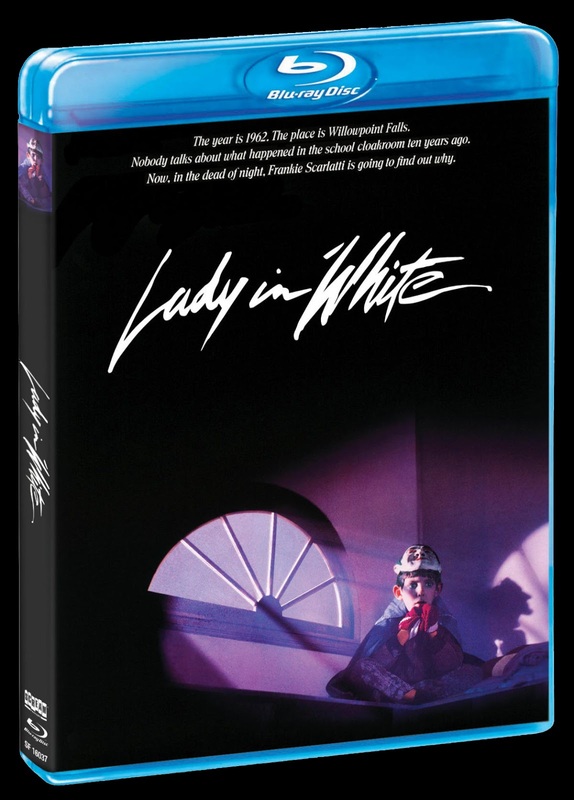 If you are looking for a movie that is brimming with old-school special effects, nostalgic set pieces, and the peculiar warmth that "growing up" can bring back to us now that we are adults ourselves, check out "Lady In White". AVOCADO BLACK-BEAN, HABANERO & SERRANO PEPPER NACHOS! Strain one 15oz can of organic black beans and pour into a large mixing bowl. W`ith a spoon mash the beans into a paste, then add one fresh ripe avocado––mash the avocado and mix thoroughly with the beans. Spice with the juice of one lemon, Tapatio Hot Sauce, Frank's Red Hot Original Cayenne Pepper Sauce, garlic powder, onion powder, paprika, and Lite 50/50 salt. Mix all together thoroughly. 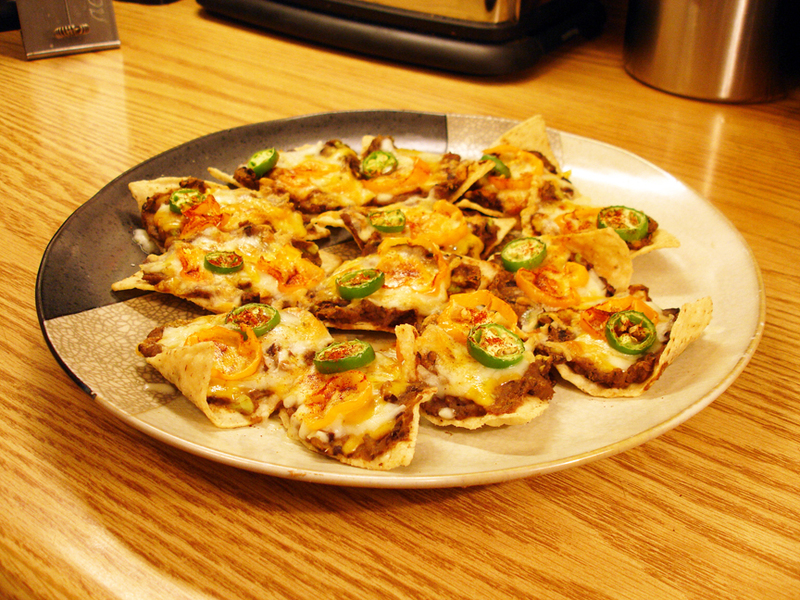 Choose whole tortilla chips and fill a dinner plate with them. Using a butter knife spread a layer of the avocado black-beans on each chip. Next sprinkle with shredded sharp Cheddar cheese and shredded Monterey Pepper Jack cheese, then top with slices of Habanero and Serrano peppers. Sprinkle with paprika. Place the plate in the oven (for me my NuWave Oven) and heat for 4 minutes (or until hot and the cheese is melted. Spicy and superb! CHICKEN, BLACK BEAN & RICE VERDE ENCHILADAS! 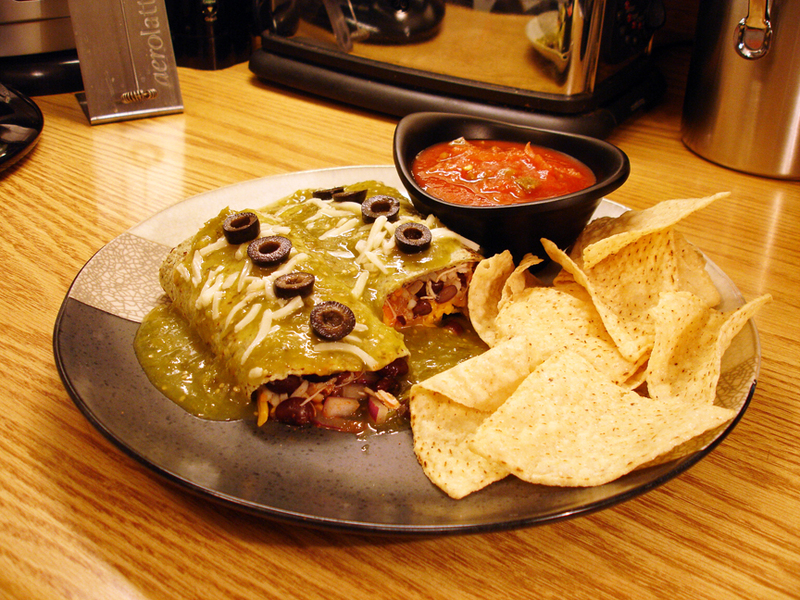 Here's a simple way to make "outstanding" Verde enchiladas. In a microwave safe bowl pour one can of Campell's Chicken & Rice soup, one 15oz can of organic black beans, and one 10oz can of white chicken breast in water (strain water and chop up with a spoon in a strainer first). Spice with Tabasco Chipotle Sauce, Frank's Red Hot Original Cayenne Pepper Sauce, garlic powder, basil, oregano, and ground black pepper. Add and stir-in spring water until the bowl of ingredients has the consistency of a soup. Heat in the microwave for 6 minutes (or until piping hot). Next lay out one Ole Spinach & Herbs (50-calorie Extreme Wellness) Tortilla on a plate. When the soup is hot, stir again. With a skimmer spoon or ladle scoop out the solid ingredients of the soup and let the liquid drain completely––then lay out the strained soup in a thick line down the center of the tortilla, add a healthy layer of diced red onions, and a layer of shredded sharp Cheddar cheese. Fold enchilada closed and roll the seam over on the plate. Cut in half. In the microwave heat a small cup of Carey Salsa Mexicana Verde Sauce (just .99¢ @ the .99¢ Only Stores) and pour over enchiladas. Garnish with shredded Monterey Pepper Jack cheese and sliced black olives. On the side: white tortilla chips and Picante Hot Sauce. So damn good, I can't get enough! Plus you can use the leftover soup for more enchiladas or eat as a spicy and delicious soup later! 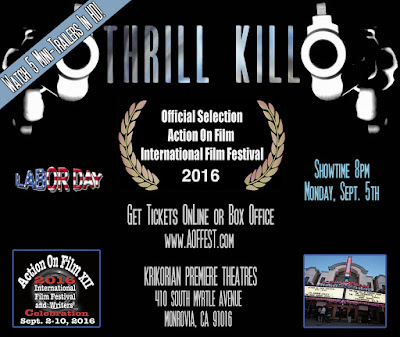 "...the screening was a success!!! Everything sounded GREAT, really GREAT...lot of people came and we got nominated. 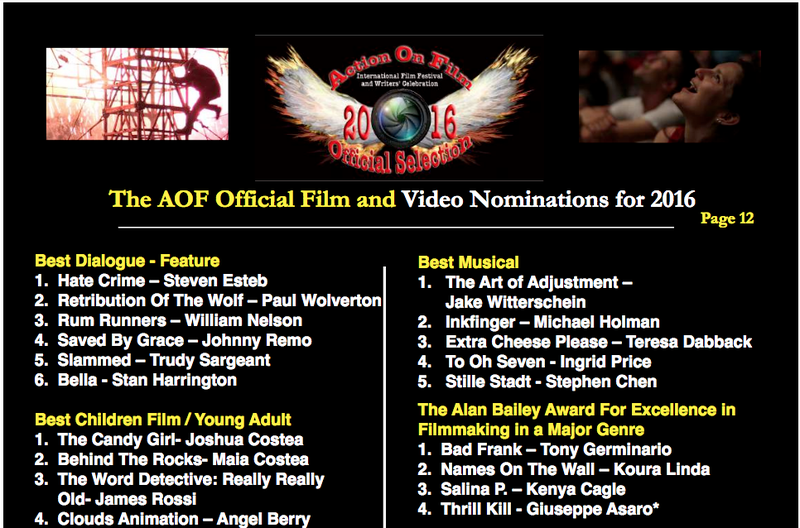 The AOF Official Film and Video Nominations for 2016––The Alan Bailey Award For Excellence in Filmmaking in a Major Genre." Seems my endless hours of audio work has paid off! 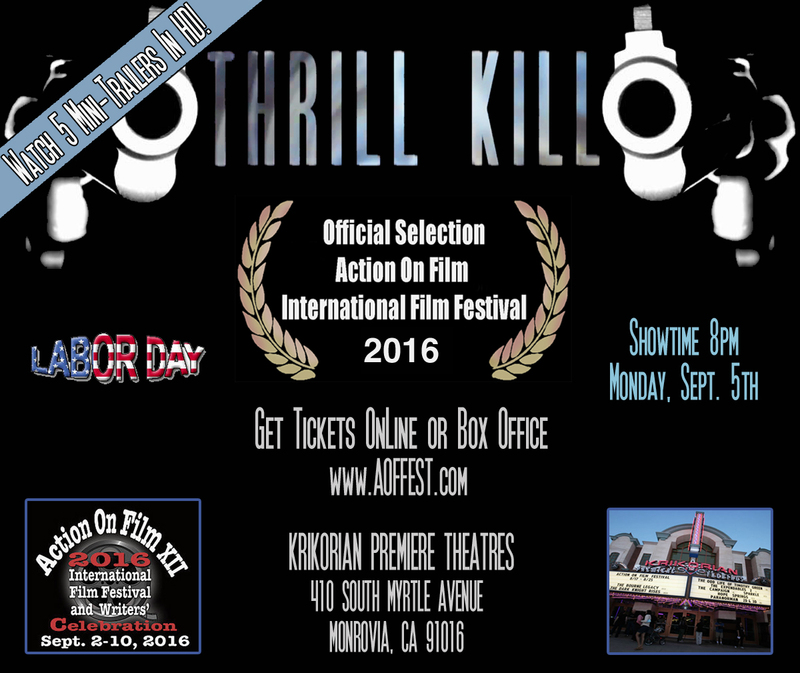 SHOWTIME 8pm, MONDAY 5th––LABOR DA! 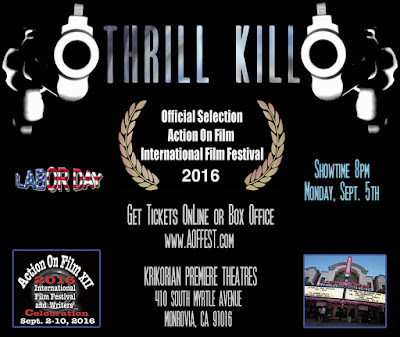 So...if you're in the Los Angeles area, please check out THRILL KILL @ 8pm, this Monday the 5th––LABOR DAY! SPICY BEEF FRANKS, BLACK BEAN & SAUERKRAUT SOUP! Didn't want a boring peanut butter sandwich so I got creative. In a large microwave safe dish pour 1 15oz can if organic black beans and 1 14oz can of sauerkraut. Next grill 4 to 5 Hebrew National 97% Fat-Free Kosher Beef Franks (on my NuWave Oven) for 5 minutes. While the franks are cooking, thickly dice red onions (amount to taste), thinly dice 1 Jalapeno pepper & 1 Serrano pepper, and put in with the beans and sauerkraut, then spice with 3-4 tablespoons of Sambal Oelek Ground Chili Paste (or other brand), basil, garlic, ground black pepper, and 50/50 salt. When the franks are ready, cut them into medium-thick slices, add to the dish of ingredients and thoroughly mix together with a spoon. 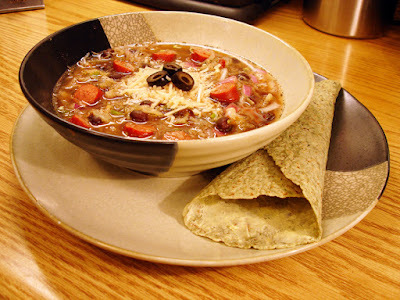 Heat in the microwave for 6 minutes (until piping hot), ladle into a soup bowl, and garnish with shredded Parmesan cheese and sliced black olives. 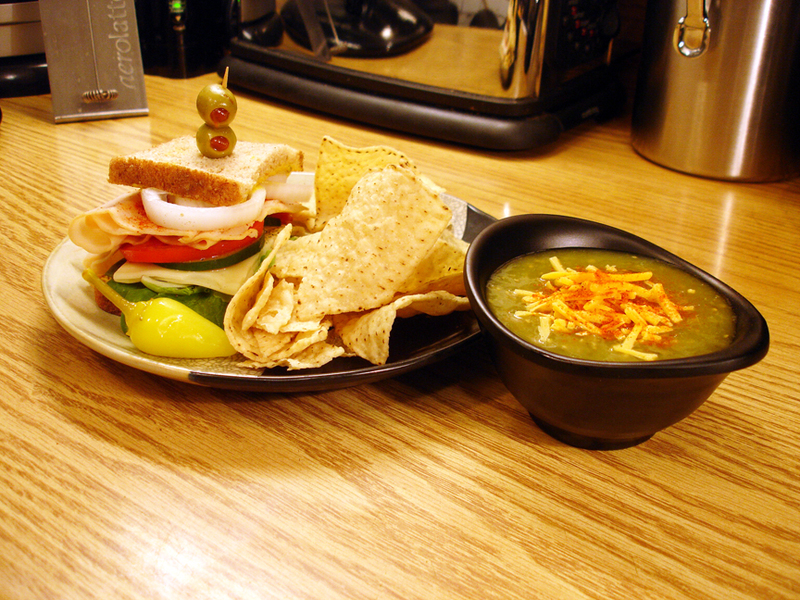 On the side: add an Ole Spinach & Herbs (50-calorie Extreme Wellness) Tortilla spread with Smart Balance Omega-3 Butter. Unique, spicy, and delicious! I'll be having some more for lunch today!